Halloween and I have a complicated relationship, at least since I became a mom. Take trick-or-treating, for instance. It’s a fun tradition, but there certainly aren’t too many healthy Halloween treats (or even close to it). Easter and a few other holidays require some similar soul-searching. Yep … I did this! I’ll admit it: when my kids were all really young, I just pretended Halloween didn’t exist. We didn’t do the trick or treating thing or the costume thing. In fact, we usually just turned out the lights and went to bed early on trick-or-treating night. I just didn’t like the idea of already grumpy toddlers staying up late to go to strangers’ houses and ask for candy packed with food dyes. As my kids get older and want to dress up, trick-or-treating is harder to avoid. On the one hand, I completely understand the fun tradition of wearing a costume and spending time with friends. On the other, I don’t love the idea of them getting bags upon bags of candy (that will make them crazy and rot their teeth out). Since I’ve learned a thing or two about balance and moderation over the years, we’ve moved on (a little reluctantly) from this option. The Candy Fairy (or Switch Witch, take your choice) visits our house after trick-or-treating and the kids don’t seem to mind a bit. We switch out the majority of the candy for a fun grab bag of treats. Since they come from our home, this also gives me the chance to throw some tasty edibles from better sources. I know, I know … handing out a treat other than name-brand candy is a surefire way to get your house rolled. I promise, I’m not suggesting handing the kids an apple or a carton of bone broth. 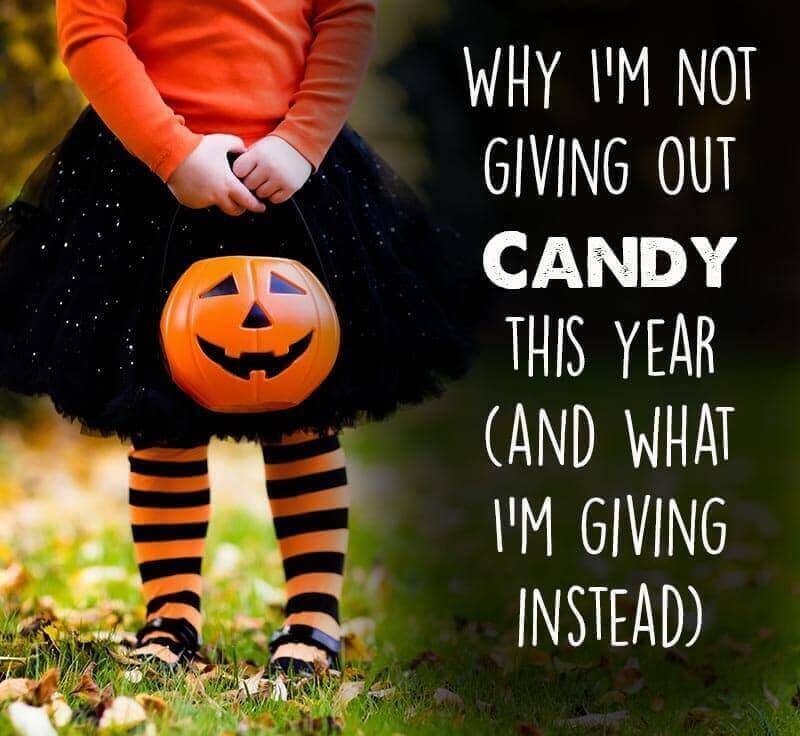 Still, since childhood obesity rates are around 17% in the U.S. (and thankfully holding steady for the last few years), wouldn’t less candy given to kids be a positive change? Too Much Sugar – With high rates of obesity and other health problems, especially among youth, I can’t in good conscience hand out tons of sugary candy. The 80/20 rule is great and there may be a time and a place for treats. The problem is that time seems to be all the time. And the place seems to be everywhere. Kids get candy at the bank, the doctor, school, and almost everywhere they go. Do they really need bags of it?! Dye Sensitivities – Many kids are sensitive to food dyes and it is tough to avoid them in most types of candy. Orthodontics – Candy and sugary snacks aren’t good for teeth and can stick to braces and other mouthpieces. Easier on Parents – When you give out non-candy Halloween treats, you save parents the trouble of checking for anything harmful in the candy. True, non-candy treats may not make your house the most popular stop in the neighborhood, but there are some really fun alternatives to candy that are definitely kid-approved. And all the other families who are trying to limit sugar or who are sensitive to food dyes will thank you! These are the top healthy Halloween treats I keep in my stash. Bonus: If you have some leftover, most of these will keep until next year! Surprisingly, mini airplanes are inexpensive and a great alternative to candy. My brother loved these when we were little and would have taken one of these over candy any day! A consumable Halloween treat that is practical. After walking around the neighborhood, kids may be thirsty. It still has sugar and isn’t an everyday thing for us, but it makes a great treat. In my opinion these taste way better than artificially flavored fruit candies! Buy them in bulk for the best price. I’ve seen them at Costco for a good price, or they’re available from Thrive Market or Amazon for a good price. My kids love bouncy balls and we don’t usually have them around the house because of all. the. bouncing. Grab a pack of 100 for cheaper than a big bag of candy and call it a day! They even make creepy eyeball bouncy balls! My oldest son brought home a bunch of these from a beekeepers’ meeting one time and they were an instant hit with his siblings. Ideally find some from a local beekeeper, or order online. These are still a sweet treat, but the beneficial properties in honey make it a healthier alternative to candy. My littles spend hours stamping pictures on paper and they gave me the idea for this candy alternative. Stamps are also cheaper than candy when you get them in bulk. I’m hoping it will cool down by Halloween, and if it does, kids will love something to warm them up after walking around. Even better, this brand uses pretty decent ingredients! A novel and practical kid favorite! Carabiners top the list of practical gifts that can be reused, and as a bonus… they are plastic free! A practical idea for kids walking around after dark! Keychain flashlights are fun for kids and a good candy alternative if you don’t live in a busy neighborhood. Order them in bulk for a good price. Feeling crafty? Get some organic oranges and use a natural marker to draw some pumpkin faces on the peel. This is probably best for a group of friends or close-knit neighborhood where people trust an unwrapped offering. If you just can’t fathom the idea of giving out something besides candy, opt for a better kind of candy. This brand of organic lollipops is dye-free and contains vitamin C.
Kids love these hilarious fake mustaches. I brought a few packs of fake mustaches to a costume party for adults once and the next morning we woke up and found all of the kids in mustaches too! For a holiday that requires a costume, these are fun to give out! I have to say, kids have ruined stickers for me. They seem to think it’s a great idea to plaster stickers on any surface to make it more festive. (There is still sticker residue on their bunk beds to prove it.) Since Halloween is about fun for the kids though, I’ll be a sucker and order 1000 of them really inexpensively for treats to give out. Bubbles are a fun activity that every kid loves. My children will play with these for hours a time! My daughters keep these mini notebooks in their mini purses so they can draw and take notes. Forget Ring Pops! These rings light up in crazy colors and are a fun way keep kids safe in the dark. Possibly the coolest item on this list! These bone-shaped pens are really cool and practical too! A great inexpensive Halloween treat to give out that stimulates creativity. Wikki Sticks are made from yarn and natural wax and are a mess-free creative way for kids to draw and build pictures. Want to be the coolest house on the block? Give out little Lego compatible figures! I don’t usually get glow sticks because of the plastic, but I’ll pull them out as a special treat or candy alternative. Glow bracelets are the most practical option because they also make kids easier to see in the dark while out trick or treating! I’ve never seen a kid leave disappointed when receiving a glow bracelet instead of candy. The downside? They are plastic. The upside? Puzzle balls are a reusable treat that encourages critical thinking. Practical but still cool. These crayon pens have multiple tips and encourage creativity. Slap bracelets were all the rage when I was a kid. Maybe they are outdated, or maybe, like many poor fashion trends of decades past, it’s time for them to come back! We usually make our own play dough, but pre-made mini play dough containers are a good alternative to candy! Another plastic toy, but when store-bought candy is at stake I’ll compromise. This kid pleaser adds to the spooky fun. Warning: they’re as bad as Legos … inevitably I end up stepping on them in bare feet around the house for months after. I remember punching these with great glee as a kid (probably in the direction of my brother’s face). This perennial party favor comes in Halloween-themed colors and encourages kids to be active and have fun! Opt for pre-packaged treats from reputable companies who use organic or natural ingredients with few to no additives. These are my favorite healthier candy “compromises” since their ingredient lists are a lot less… scary! What’s your policy on candy on Halloween? 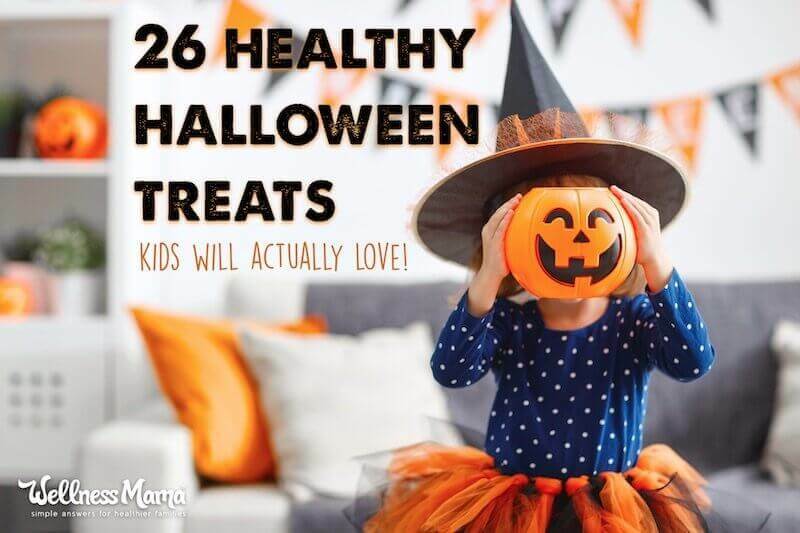 Which healthy Halloween treats would you like to see your kids bring home? Next articleMegyn Kelly: Could ‘blackface’ row end TV anchor’s career?